Mutual Recognitions | Institut Bauen und Umwelt e.V. 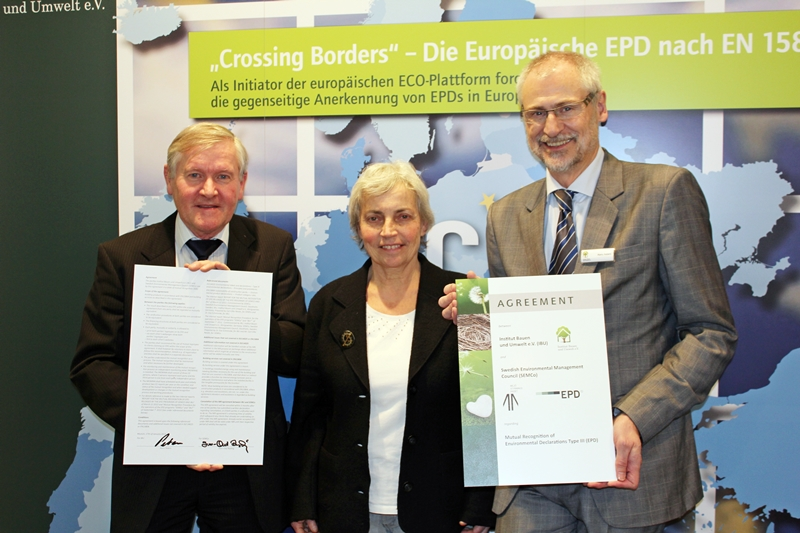 Parallel to its efforts of harmonizing EPDs within Europe at the ECO Platform, IBU fosters the process of mutual recognition on a bilateral level together with selected European and international programme holders according to EN 15804. Hereby, IBU intends to save its members money and time when issuing their EPDs with others programme holders. During the trade fair BAU 2017 in Munich, IBU has signed a new mutual recognition with BRE from the UK in the person of Managing Director Dr. Burkhart Lehmann and IBU President Prof. Dr. Horst Bossenmayer. 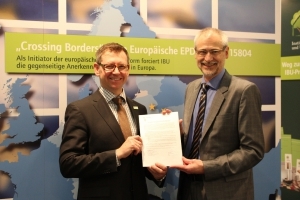 During the trade fair BAU 2017 in Munich, IBU has signed a new mutual recognition with the Italian EPD-Program EPD Italy in the person of Managing Director Dr. Burkhart Lehmann and IBU President Prof. Dr. Horst Bossenmayer. EPD Italy was represented by the President of ICMQ, Prof. Enrico Dassori, Lorenzo Orsenigo (Direttore Generale) and Ugo Pannuti (Sustainability Advisor). “In order to encourage the harmonization, a manufacturer has to be able to provide its EPD in all rating schemes in Europe. This mutual recognition is a big advantage for Italian and German Manufacturers that want to declare the environmental characteristics of their products through the Environmental Product Declaration, in Europe.”, said Prof. Dassori. In early 2015, with the signing of official documents by IBU Managing Director Dr Burkhart Lehmann and Avelino Brito, the CEO of AENOR, the process of establishing mutual recognition with AENOR was successfully concluded. This agreement was the end result of a statement of intent that had been signed by AENOR and the IBU in 2013 in Madrid. 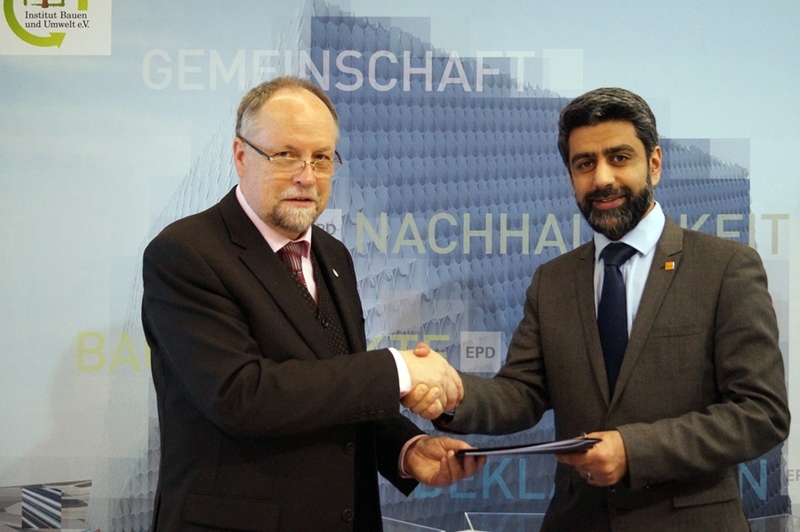 Signing the agreement of mutual recognition of EPD programmes with the Danish programme holder DTI (Danish Technological Institute) meant a highlight for IBU in the beginning of 2015 at the trade fair BAU. Mathias Sehested Høeg Kemner from DTI explained: “The co-operation with IBU is an important step for our declaration owners. 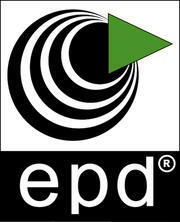 They can now bring their EPDs to the German market, due to mutual recognition with IBU. 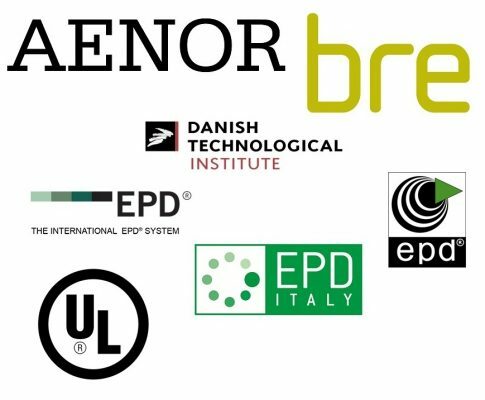 At the same time, we are looking forward to publishing German EPDs issued by IBU here in Denmark in our “Danmark System”, and thereby advancing EPDs Europe-wide”. 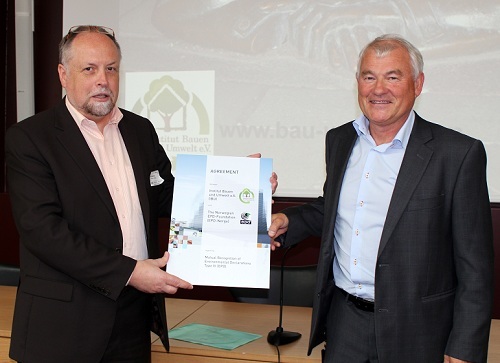 In the course of the Annual General Meeting of EPD Norge in June 2014 IBU’s Managing Director Dr. Burkhart Lehmann and EPD Norge’s Managing Director Dagfinn Malnes signed the contract for the mutual recognition of the two EPD-Programmes. With this declaration holders of EPDs verified by IBU can have their EPDs recognised in Norway by the Programme operator “The Norwegian EPD Foundation (EPD-Norge)” without having to undergo a further, comprehensive verification process. EN 15804 +A1 is the common basis for the mutual recognition. During the preliminary stages Anne R. Rønning for EPD-Norge and Dr. Eva Schmincke for IBU in particular, worked on determining the parameters for the mutual recognition of EPDs. In order to publish an IBU EPD in the Norwegian Programme, the EPD needs to be in English and additional information has to be compiled and added in an attachment. 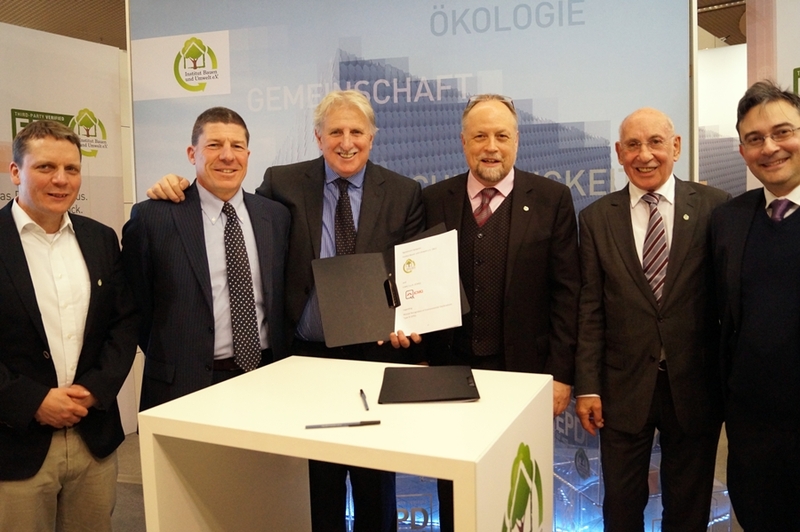 Following the signing of a statement of intent in January 2013 at the world’s leading industry trade fair, BAU, the IBU negotiated mutual recognition of Environmental Product Declarations (EPDs) with the North American programme owner, UL Environment. This recognition was instituted at the end of 2013. Recognition in the North American market is especially important for members of the IBU, because the American building certification system, LEED, in its latest version (v4), for the first time awards credits to building projects that incorporate products that have an EPD. The contractual agreement was preceded by nearly a year of negotiations. IBU’s technical expert, Dr Eva Schminke, worked with Paul Firth from UL Environment to establish the conditions of the collaboration. The two, both experts in life cycle assessments and sustainable building, agreed, among other things, upon a standardisation of the verification process, which would assure comparable quality of life cycle assessments, ensuring that they meet with the guidelines set forth in EN 15804. Manufacturers who wish to have their IBU-EPDs incorporated by UL Environment must provide additional documentation on the impact indicators from the life cycle assessments, on the basis of the TRACI factors that are commonly used in the USA. For existing EPDS, the life cycle assessment that has already been created may be used to obtain this additional information. For new EPDs, the evaluation needed for TRACI requirements should be integrated into the background report directly during the creation of the life cycle assessment. “Our members now have a very easy way to present their EPDS on the American market”, explained IBU Managing Director Dr Burkhart Lehmann, in describing the advantages of this collaboration. “This not only saves money, but also increases the value of the IBU EPDs.” The IBU is particularly pleased that it was possible to enter into the agreement with UL Environment on the basis of the standards set forth in EN 15804. “It cannot be taken for granted that an American organisation will agree to follow European standards”, continued Dr Lehmann, “but we were able to convince UL Environment of the qualities that are inherent in the European concept of sustainability”. The IBU’s first international agreement was signed in 2013 at the BAU trade fair in Munich: a contractual agreement for mutual recognition was thereby established with the Swedish EPD programme “The International EPD®-System”. Owners of IBU declarations have since then had the opportunity, for a flat registration fee, to co-publish their EPDs on the Swedish EPD program website – www.environdec.com.